I went to Matsuyama with my husband and friend this September. It took about 2 and half hours from Kurashiki by car. We turned off the Matsuyama highway at Matsuyama Interchange. It took about 10 minutes to Itami Juzo Museum from there. We found it on our right side. 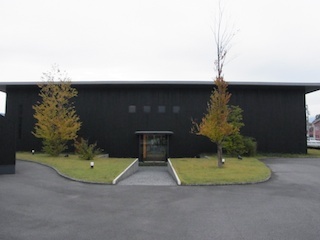 What a black house! So nice. I was more excited when I went into the Museum. Outside was black and cool, but inside was wooden and warm. There was a courtyard in the center of house. It was so lovely to have a tea time with seeing this courtyard. I would like to visit there again.